The Snail is available as a Standalone application for Mac and Windows OS, and AAX, AU and VST plug-in. It offers a new way of tuning and analyzing an instrument in an extremely accurate way, displaying intonation and visualizing music and sounds in a way that can help anyone improve their listening and intonation! Think of a film camera turning at 24 frames per second filming a bicycle wheel turning at 24 revolutions a second, the spokes will appear to be standing still. That means, for a Fourier analysis of frequency at 439Hz compared to a tuning reference of 440Hz, the demodulated phase will turn at 1Hz (as a slightly desynchronised stroboscope makes a rotating object have a slow movement). Think of audio signals ’beating’ as there is a interference between two sounds at slightly different frequencies. 3. Exploit the local information to deliver a new notion of tuning (available for slightly or highly inharmonic sounds) and to visualize the harmonicity quality (a “bad string” can be immediately identified or a resonance that is out of tune in your instrument, or resonances that cause some notes to be more present (ringing) than other - which might be desirable or not). The Demo version of The Snail is a fully functional 15 day trial version without any limitations. 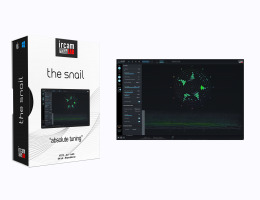 Download directly from the bottom of the Product page and install the full IRCAM Lab "The Snail" software. Welcome to Absolute Tuning!